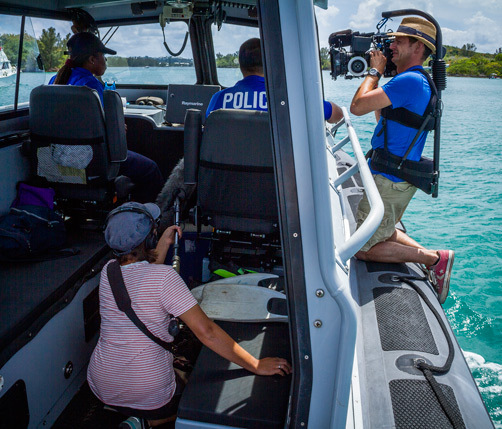 A German film crew has been exploring Bermuda this month for a programme that will air on their national TV network. The three-strong team have recorded footage across the island for the 45-minute documentary called mare TV or Ocean TV. The show is part of a long-running series of award-winning shows on the North German Broadcasting Corporation that highlight islands across the globe and their ocean environment. The German team in Bermuda has been led by wildlife photographer and producer Heiko De Groot. He arrived on June 4, and was followed a few days later by the two other members of the team: sound technician Tarja Kuehne and cameraman, Florian Melzer. Mr De Groot said: “The colours in Bermuda are fantastic to film and we have been able to get some great footage. “Whether it’s the water, the green palms or the houses, it gives us fantastic pictures. “You get a lot of colourful homes in Scandinavia, but you don’t get the weather and the sun like you do here. It’s been a completely different and interesting mix of colours, which is completely unique. Over the last couple of weeks the crew have joined up with the Marine Police for a day of patrol on the water, visited the Cahow project on Nonsuch Island and met with Johnny Barnes. They have also filmed footage at the Bermuda Regiment, the English Sports Shop and the Paget Community Garden. Mr De Groot told the Bermuda Sun: “It has been a very successful trip. “I think Bermuda is a destination that many people in Germany would love to come to. The mare TV series was launched in 2001 and covers a range of issues relating to the oceans of the world. Mare TV is broadcast twice a month on a Thursday at 8:15pm on NDR television. Although the crew organized the trip to Bermuda themselves, the Bermuda Tourism Authority played a big role in facilitating and co-ordinating its daily work schedule.